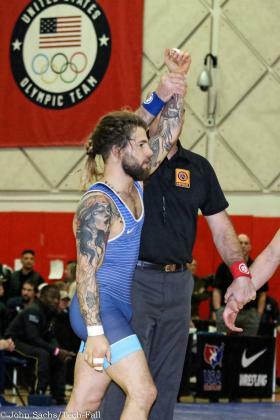 Marquette, Mich.—The Northern Michigan University Olympic Training Site had five Greco-Roman wrestlers finish in the top three after the first day of competition at the Dave Schultz Memorial in Colorado Springs, Colo.
Finishing in first at 63 kg was Sammy Jones. In the final match, Jones finished the first period down by three to NMU alumnus Travis Rice of the NYAC. In the second period Jones came back to score three points, holding Rice scoreless and won with a 3-3 criteria decision. Randon Miranda brought home the other first-place finish for the NMU-OTS squad. In his 55 kg weight class, no wrestler finished the five-athlete round robin undefeated. Miranda earned the top spot with two technical falls and a pin, which gave him the most classification points. Teammate Dalton Duffield finished with a 2-2 record to claim the silver medal. Finishing third at 60 kg was Dalton Roberts. Roberts faced Ty Pelot of X-Factor Elite Wrestling in the bronze-medal match, winning with a 10-0 technical fall. Austin Morrow earned his bronze medal at 67 kg by defeating 2016 Olympian Jesse Thielke of the NYAC. Morrow struck quickly, scoring with a four-point throw 25 seconds into the match and went on to win with an 8-0 technical fall in the first period. The Dave Schultz International Memorial continues through this weekend with the final Greco-Roman matches ending today.